Last week, Governor Paterson announced a plan to lay off 898 state workers and allow another 1,102 positions that are vacated by the end of the calendar year to go unfilled. Public employee unions will challenge the legality of the layoffs by arguing they violate a memorandum of understanding that promised no layoffs until January 2011. However, in two months the MOU expires and layoffs will be an option as the State confronts an $8 billion gap for the new fiscal year beginning April 1, 2011. Eliminating these 2,000 positions would reduce the number of full-time state employees to 190,380, a 5 percent reduction from the end of fiscal year 2008-09. However, an overall decline of 5 percent masks disparities among agencies. All 2,000 of the positions to be eliminated are in agencies controlled by the Governor. Staffing at these agencies has been declining for decades and has taken the brunt of recent workforce reductions. In contrast, employment at agencies beyond the control of the Executive, such as the State University of New York (SUNY), the City University of New York (CUNY) and the Judiciary has expanded. 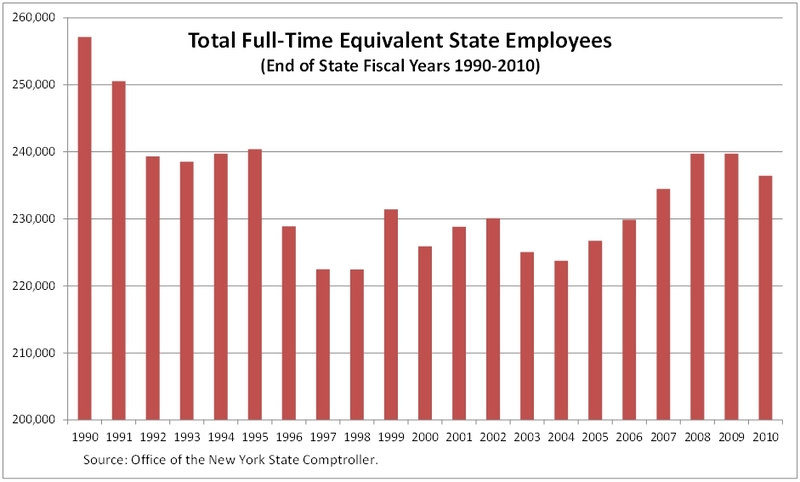 As shown below, full-time equivalent employment at SUNY, CUNY and the Judiciary combined grew 29 percent (or 20,000 FTEs) since the end of fiscal year 1989-90, while the rest of the state workforce contracted 22 percent (or 41,000 FTEs). As of the end of state fiscal year 2009-10, the state workforce outside of those three agencies was below levels reached in the last two recessions. 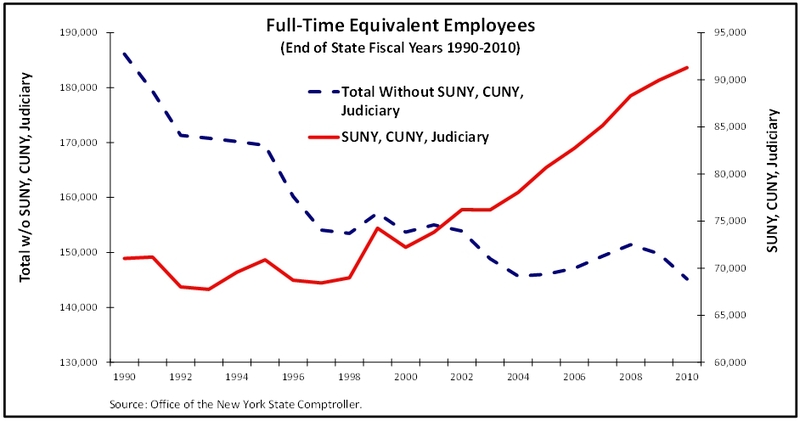 In the last recession, from fiscal year 2000-01 to 2003-04, staff at SUNY, CUNY, and the Judiciary grew 6 percent, as the rest of the workforce fell 6 percent. Over the last two fiscal years, these three agencies expanded 3 percent while all other state agencies contracted 4 percent. In total the state workforce was 8 percent smaller at the end of fiscal year 2009-10 than at the end of fiscal year 1989-90. However, the full workforce is 6 percent larger than it was at the end of fiscal years 1997-98 and 2003-04.
he public employee unions are right when they say the workforce at certain agencies is at historic lows. However, compensation for the state workforce still accounts for more than one-fifth of the non-federal portion of the State’s budget; an item this substantial should not be excluded from options to close next year’s budget gap. However, reducing the cost of health insurance and retiree benefits is a preferable option to layoffs; it would save money and prevent further deterioration of state services. For example, increasing employee premium sharing for family health insurance plans from 25 to 30 percent would save $79 million annually, the equivalent savings from letting go of 898 workers.